Symbol of the triratna, as seen in the Sanchi stupa, first century B.C.E. Taking refuge in these "Triple Jewels" is generally considered to make one officially a Buddhist. These three vows are central to both Buddhist lay and monastic ordination ceremonies, as initiated by Gautama Buddha himself. I take refuge in the Buddha, wishing for all sentient beings to understand the great way and make the greatest vow. I take refuge in the Dharma, wishing for all sentient beings to deeply delve into the Sutra Pitaka, gaining an ocean of knowledge. I take refuge in the Sangha, wishing all sentient beings to lead the congregation in harmony, entirely without obstruction. The prayer for taking refuge in Tibetan Buddhism. By the merit I have accumulated from practicing generosity and the other perfections. May I attain enlightenment, for the benefit of all migrants. 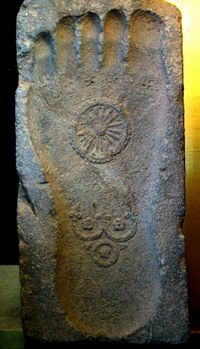 The Triratna or "Three Jewels" symbol, on a Buddha footprint (bottom symbol, the top symbol being a dharmachakra). First century C.E., Gandhara. The qualities of the Buddha, Dharma, and Sangha are frequently repeated in the ancient texts and are called "Mirror of the Dhamma" or "Dhamma Adassa." The Buddha: "The Blessed One is an Arahant, perfectly enlightened, accomplished in true knowledge and conduct, fortunate, knower of the world, unsurpassed leader of persons to be tamed, teacher of devas and humans, the Enlightened One, the Blessed One." Sometimes the Buddha as refuge is taken to refer to the historical Buddha and also 'the full development of mind', in other words, the full development of one's highest potential, i.e. recognition of mind and the completion or full development of one's inherent qualities and activities. In this context, the Triple Gem is in the center of one of the major practices of mental "reflection" in Buddhism; the reflection on the true qualities of the Buddha, Dharma and Sangha. These qualities are called the Mirror of the Dharma in the Mahaparinibbana Sutta and help the practitioner attain the true "mind like a mirror." The Dharma: Refuge in the Dharma, in the Vajrayana, tradition includes reference not only to the words of the Buddha, but to the living experience of realization and teachings of fully realized practitioners. In Tibetan Buddhism, it includes both the Kangyur (the teaching of the Buddha) and the Tengyur (the commentaries by realized practitioners) and in an intangible way also includes the living transmission of those masters, which can also be very inspiring. The Sangha: In the Vajrayana, a more liberal definition of Sangha can include all practitioners who are actively using the Buddha's teachings to benefit themselves and/or others. It can be more strictly defined as the 'Realized Sangha' or 'Arya-Sangha', in other words, practitioners and historical students of the Buddha who have fully realized the nature of their mind, also known as realized Boddhisatvas; and 'Ordinary Sangha', which can loosely mean practitioners and students of the Buddha who are using the same methods and working towards the same goal. Triratna symbol on the reverse (left field) of a coin of the Indo-Scythian king Azes II (r.c. 35-12 B.C.E.). the Guru, considered the "Root of Blessing"
the Yidam, which is the "Root of Methods"
Dakini or Dharmapalas, considered the "Root of Protection"
These are seen as forms of the Body (Sangha), Speech (Dharma) and Mind (Buddha) of the Buddha. Of these, the guru has the most prominent place in the Vajrayana, as without his personal assistance and guidance, a practitioner cannot achieve proper spiritual progress. The outer three jewels are the Buddha, Dharma, and Sangha. The Three jewels have an inner aspect, known as the Three Roots: the Guru (or Teacher), who is the root of blessings; the Yidam, who is the root of accomplishment; and the Dakini, who is the root of enlightened activity. Although the names are different, these three do not in any way differ from the Three Jewels. The Guru is the Budha [sic], the Yidam is the Dharma, and the Dakinis and Protectors are the Sangha. And on the innermost level, the Dharmakaya is the Buddha, the Sambhogakaya is the Dharma, and the Nirmanakaya is the Sangha. The three gems are so called because of their treasured value to Buddhists as well as their indestructible and unchanging nature. The Three Gems when used in the process of taking refuge, become the Three Refuges. In this form, the metaphors occur very frequently in the ancient Buddhist Texts, and here the Sangha is used more broadly to refer to either the Sangha of Bhikkhus, or the Sangha of Bhikkhunis. "I go to Master Gotama for refuge and to the Dhamma, and to the Sangha of Bhikkhus." Buddha's mind in his earth body or sambhogakaya is frequently associated with the greatest gem of all, the diamond, the hardest natural substance. In the Anguttara Nikaya (3:25), Buddha talks about the diamond mind, which can cut through all delusion. The expression Three Gems are found in the earliest Buddhist literature of the Pali Canon, besides other works there is one sutta in the Sutta-nipata, called the Ratana-sutta which contains a series of verses on the Jewels in the Buddha, Dharma, and Sangha. One who is irascible and very irritable, displaying anger, hatred and sulkiness; such a one is said to be a person with a mind like an open sore. One who understands the "Four Noble Truths" correctly is said to have a mind like a flash of lightning. In Buddhism, the "Triple Gem" is not a metaphor and actually the initiation into the Dhamma that every Buddhist must take. However, it is used metaphorically in Jainism and Taoism. When Buddhism was introduced into China, ratnatraya was translated as sanbao (Chinese: 三寶; pinyin: sānbǎo; Wade-Giles: san-pao; literally "three jewels/treasures"), a word that first occurs in the Dao De Jing. 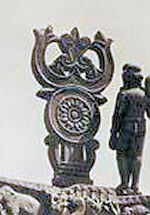 The compound Buddhist symbols: Shrivatsa within a triratana, over a Dharmacakra wheel, on the Torana gate at Sanchi. First century B.C.E. A |lotus flower within a circle. A diamond rod, or vajra. A trident, or trisula, with three branches, representing the threefold jewels of Buddhism: Buddha, the Dharma and the Sangha. On representations of the footprint of the Buddha, the Triratna is usually also surmounted by the Dharma wheel. The Triratna can be found on frieze sculptures at Sanchi as the symbol crowning a flag standard (second century B.C.E. ), as a symbol of the Buddha installed on the Buddha's throne (second century B.C.E. ), as the crowning decorative symbol on the later gates at the stupa in Sanchi (2nd century C.E. ), or, very often on the Buddha footprint (starting from the first century C.E.). Second century B.C.E. coin of the Kunindas, incorporating on the reverse the Buddhist triratna symbol on top of a stupa. The Triratna is also on the first century B.C.E. coins of the Kingdom of Kuninda in northern Punjab, surmounting depictions of stupas, on some the coins of the Indo-Parthian king Abdagases, or the coins of some of the Kushan kings such as Vima Kadphises. The triratna can be further reinforced by being surmounted with three dharma wheels (one for each of the three jewels of Buddhism: the Buddha, the Dharma and the Sangha). 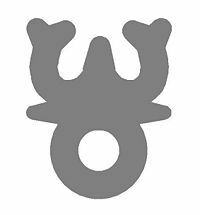 The triratna symbol is also called nandipada, or "bull's hoof," by Hindus. ↑ Bhikkhu Bodhi, The Connected Discourses of the Buddha A New Translation of the Saṃyutta Nikāya, Translated from the Pāli (Somerville, MA: Wisdom Publications, 2000, ISBN 9780861711895). ↑ Reginald A. Ray, In the Presence of Masters Wisdom from 30 Contemporary Tibetan Buddhist Teachers (Boston: Shambhala, 2004, ISBN 781570628498). ↑ Ñāṇamoli and Bodhi, The middle length discourses of the Buddha a new translation of the Majjhima Nikāya. Teachings of the Buddha (Oxford: Pali Text Society in Association with Wisdom Publications, 2001, ISBN 9780860134008). ↑ Dines Andersen and Helmer Smith, The Sutta-nipāta (London: published for the Pali Text Society by Luzac, 1965, OCLC 3336548). ↑ Laozi and Victor H. Mair, Tao Te Ching The Classic Book of Integrity and the Way (New York: Bantam Books, 1990, ISBN 9780553349351). This page was last modified on 7 December 2015, at 22:55.